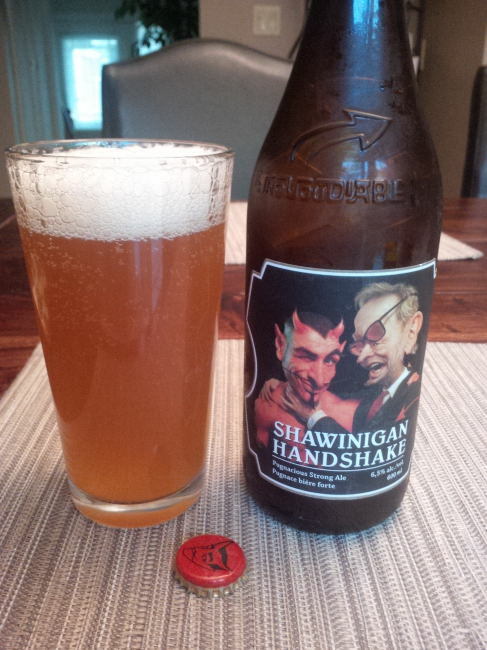 From Le Trou Du Diable out of Shawinigan Quebec comes their “Shawinigan Handshake” a Weizen Bock. The beer pours a cloudy orange colour with a white head. The aroma is of malts, fruits such as orange, banana and lemon, wheat and spruce. The flavour consisted of malts, yeast, rind, orange, banana, lemon, pepper, spruce, wheat and bitter hops. The alcohol content comes in at 6.5%. This is a very tasty Weizen Bock that matches up with the great label. Commercial Description: “A proof is a proof” The Shawinigan Handshake is a hazy, peach-coloured beer with notes of bread, banana and spruce, reflecting the flavours of German yeast and Chinook hops. With explosive effervescence, the palate first evokes flavours of banana followed by a dry, spruce finish. Bottled with the approval of the Little Guy from Shawinigan, the Right Honourable Jean Chretien, this beer reflects the sharp sense of humour of this legendary political figure. This entry was posted in Weizen Bock and tagged banana, bitter hops, canada, hops, hopy, lager, le trou du diable, lemon, malt, malts, malty, orange, pepper, quebec, rind, shawinigan, shawinigan handshake, spruce, weizen bock, wheat, yeast.